The laundry room has become quite popular in recent times. People love the idea of having a dedicated room to deal with laundry. This also provides a great opportunity to transform this chore into something more enjoyable. 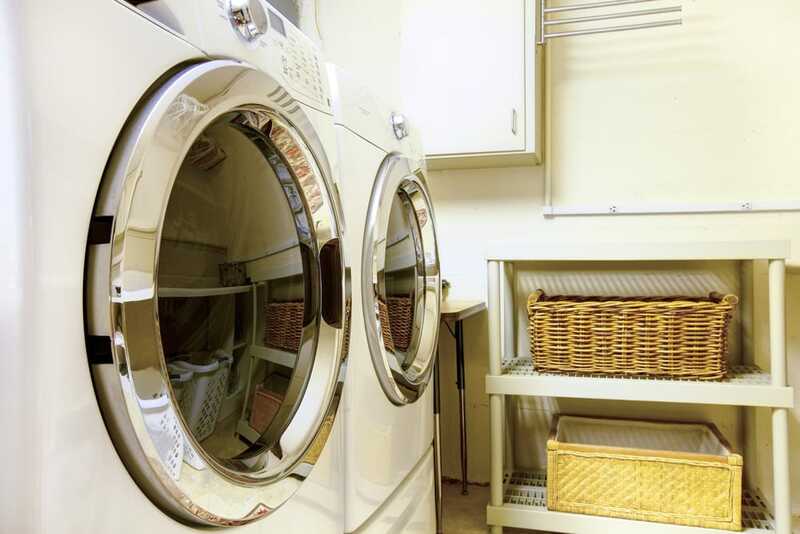 When setting up your laundry room, consider the most convenient location for it. Generally, it’s a good idea for it to be near closets or in a bathroom. Make sure that you also take into account the increased vibration from the washing machine in case you decide on second-floor placement. While the laundry room primarily accomplishes a functional role, that doesn’t mean it needs to have a monotonous and utilitarian look. 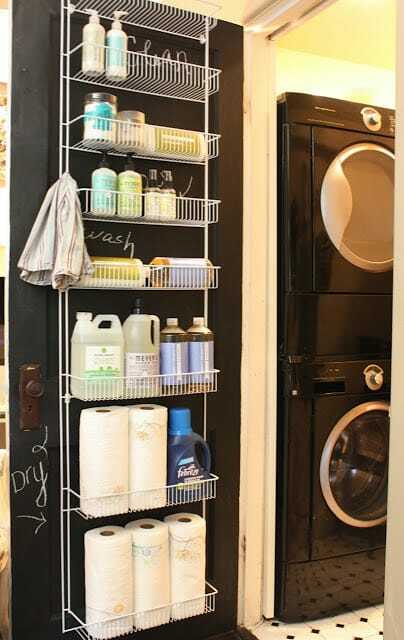 Discovering some innovative storage solutions or trying out some new organizational hacks – these are recommended for any laundry room. You should also pay attention to the importance of the way the room looks. Focus on a look that’s both functional and eye-catching. Incorporate some lovely decorations that help you go through this regular chore and make it less dreary. 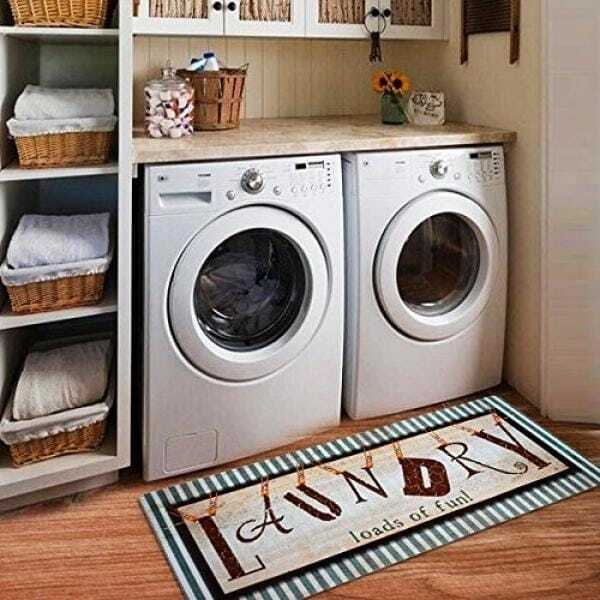 Let’s find out the best ideas that you can use for the laundry room. 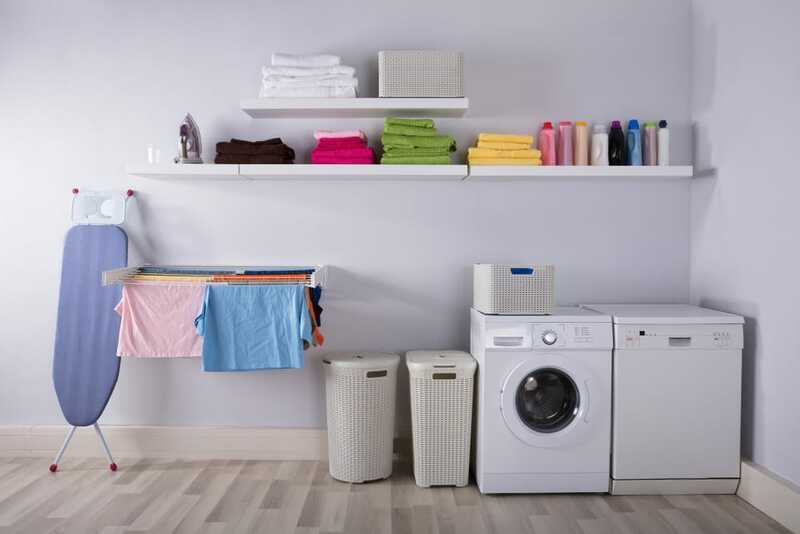 Having enough storage is essential when it comes to the laundry room. From extra cabinetry to shelves and other elements, it always pays off to have more room to store various laundry essentials. To stay better organized, consider implementing an effective sorting system for the dirty laundry. You can do so with the help of separate bins. Once everyone gets used to the simple system you devise, you will make some great time savings when it’s time to do the laundry. 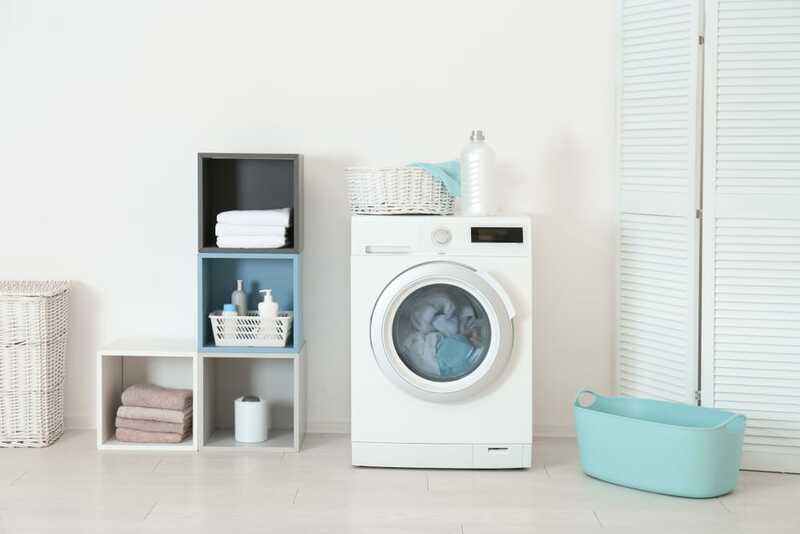 Having the washer and dryer side by side is simple and effective, but you can also try some more innovative layouts. If you have enough space upwards, we suggest trying out a vertical stacking solution. This might help when it comes to fitting these bulky machines in a more compact manner. Another functional solution to consider is the raised layout for both the washer and dryer. It’s more pleasant to load and unload the machines when they’re found at a comfortable level. This is especially recommended if you have back issues and wish to avoid bending over. Cabinets are very appreciated furniture elements that you should add in any laundry room. There’s no need to make huge investments here. Even the more inexpensive models will offer a nice upgrade for the laundry area. If you go for white cabinetry, you can then customize them more easily with some wallpaper or other wall decorations that offer some contrast. Adding a colorful touch in the laundry room can have a big impact on the visuals of this space. The easiest way to do that is by painting the walls or cabinets. Whether you prefer a calming blue or some vibrant citrus tones, it’s all up to your personal tastes. You will immediately notice after integrating a colorful theme that this area becomes livelier and puts you in a better mood. 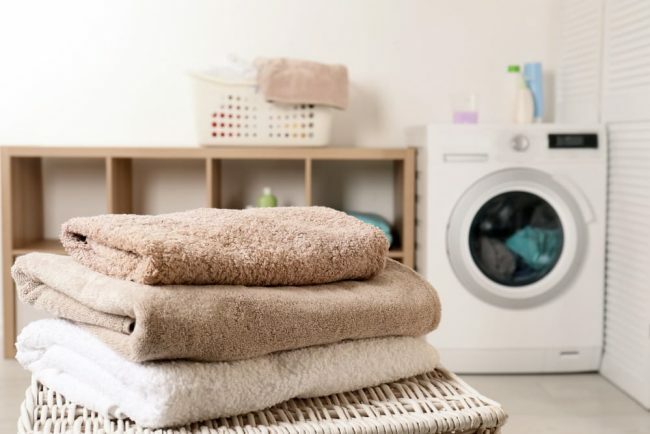 The laundry room is a good place to deal with dirty laundry, but you also need to consider how you deal with clean clothes after they’re washed and dry. This area provides a solid opportunity to deal with the folding process. The best way to do this is by incorporating adequate counter space which lets you work comfortably and keep the room tidier. Some larger rooms can benefit from an included island to increase the usefulness of the entire area. If your room’s space comes at a premium, you just need to work with what you’ve got. It’s highly recommended to extend the counter space over the washing and drying machines. This makes for better utilized square footage in a small room. 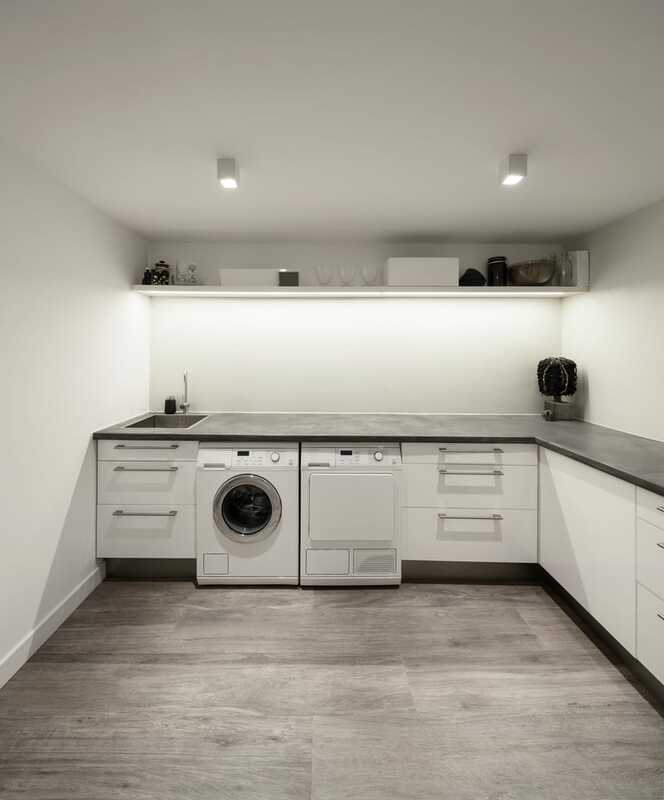 Is the lighting in the laundry room sufficiently bright? This is something that you might not have noticed, but upgrading the lighting can have a major effect. Consider changing that simple light bulb with a larger fixture that has the power to brighten up the entire room. One important reason why having good lighting is critical is that it allows you to discover pesky stains that are hard to observe otherwise. Difficult stains need to be carefully pre-treated before washing. Maybe you can even go a step further and install extra lighting solutions such as pendants or under-the-cabinet light strips. We’ve already mentioned the idea to paint the walls in a vibrant color. That’s one method to give the walls some personality. 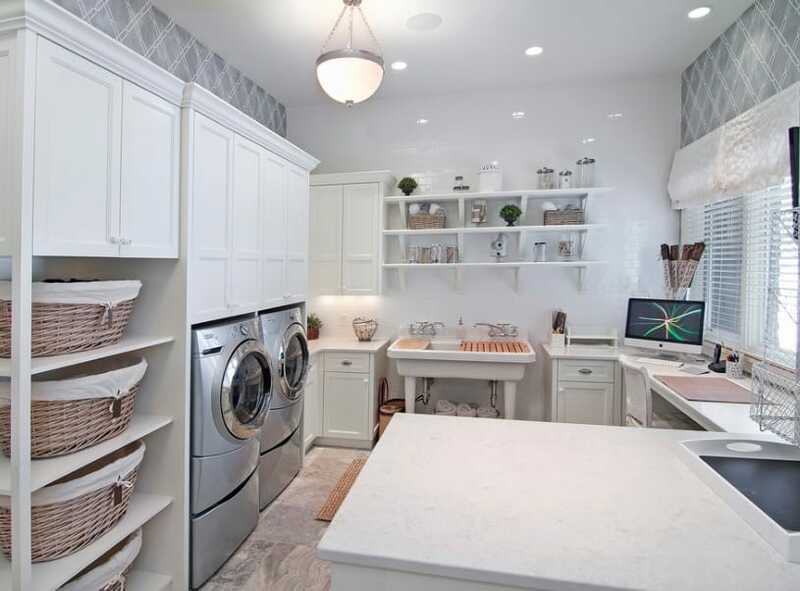 Another one is to make clever use of patterns and textures to make the laundry room stand out. A high-end backsplash can achieve the purpose of decorating the walls and it doesn’t necessarily involve huge costs. There’s no need for a lot of tiles if you’re dealing with a compact laundry room. 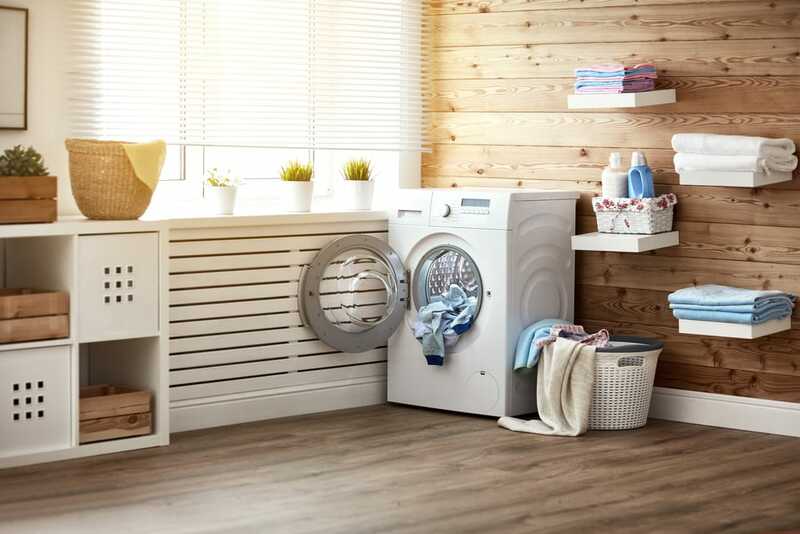 Certain clothing pieces that are usually more delicate don’t work well in the dryer so that’s why it could be useful to install a drying bar in the laundry room. You will probably not need a lot of space for air-drying these items, so even smaller rooms can easily accommodate this type of bar. 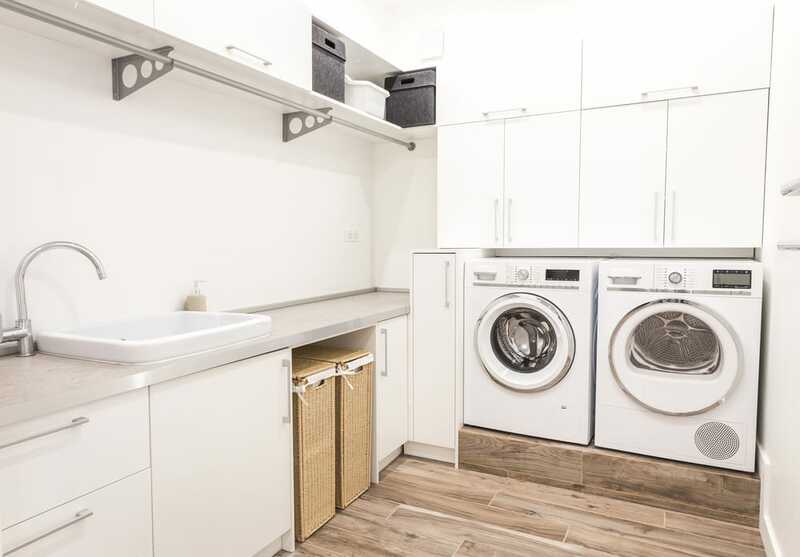 Not all laundry rooms need to have complex designs. 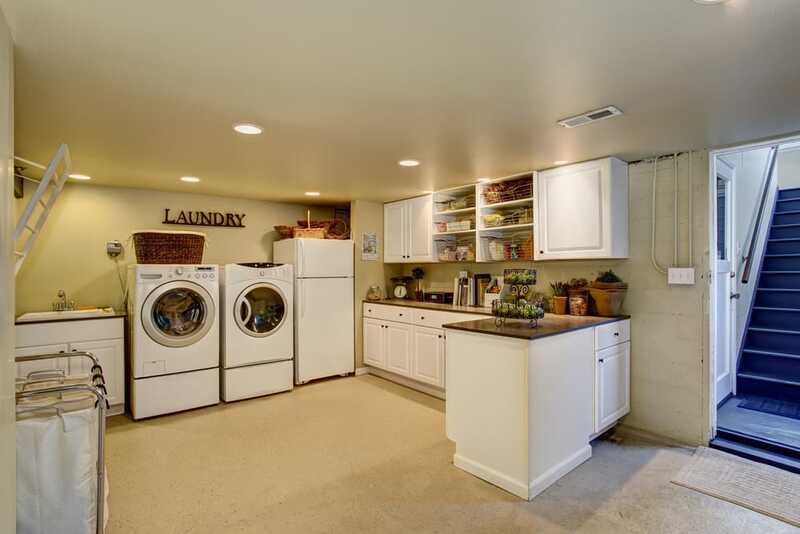 Many people are better off with only the essential features and items of a laundry room. Minimalists will appreciate a compact and efficient design which can also simplify the laundry process making it more pleasant. Instead of ugly bins and baskets made of plastic, you could opt for woven baskets to keep dirty clothes out of sight in style. They bring a rustic flavor which can fit in to break up the coldness of a modern laundry room. Check out this seagrass storage basket from Amazon that’s large enough to fit your laundry and provides some traditional strength. 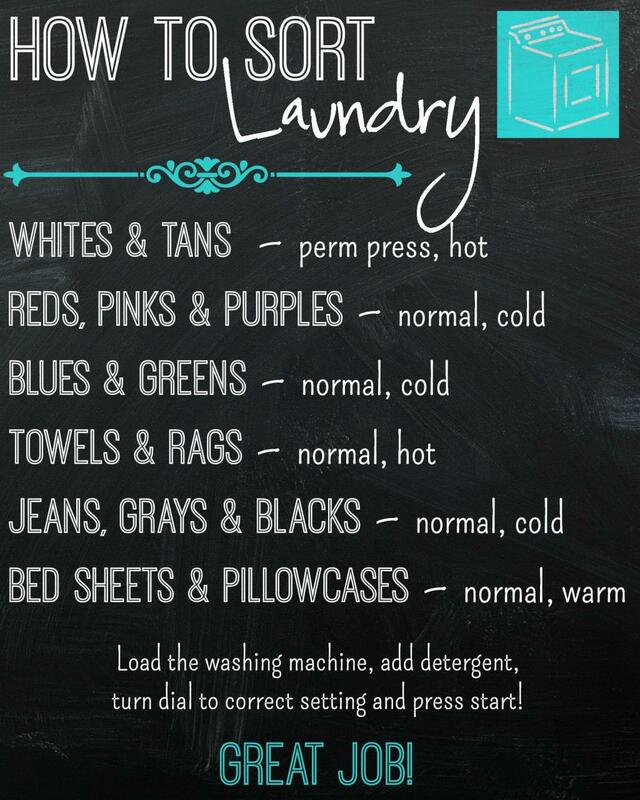 An informative chart could be a useful addition to the laundry room. Whether it’s a sorting guide or a stain removal cheat sheet, there are lots of interesting options you can find and print. Then, it’s simply a matter of laminating them and finding the best place to hang the charts. Whenever you forget how to do a particular step or need a stain removal tip, you can just check the chart. A simple glance and you’re done. If you’re short on space, you can squeeze in a laundry room in a closet. It’s not truly like a room, but it should be enough to add your essential items such as the washing machine, shelves, and some counter space. It’s great that you can close the doors after you’re done so everything looks neat. When designing your laundry room, you need to take into account the tedious parts of the chore and how can you make them more pleasant. An interesting solution to the problem of carrying clothes back and forth is to add some wheeled laundry baskets. This makes things so much easier and storing the carts is a breeze as well. If you wish to take it a step further, you can get a more heavy-duty cart that comes with the added bonus of sorter bags. This enables you to separate your laundry in durable bags and make the entire process effortless with the help of reliable casters. Take a look at this chrome-styled laundry sorter cart from Amazon. 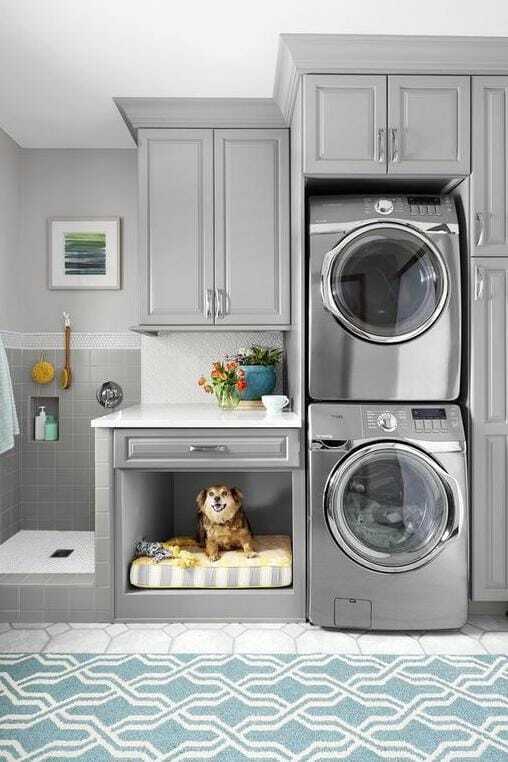 A somewhat unexpected addition to the laundry room is a dedicated space for your pet. 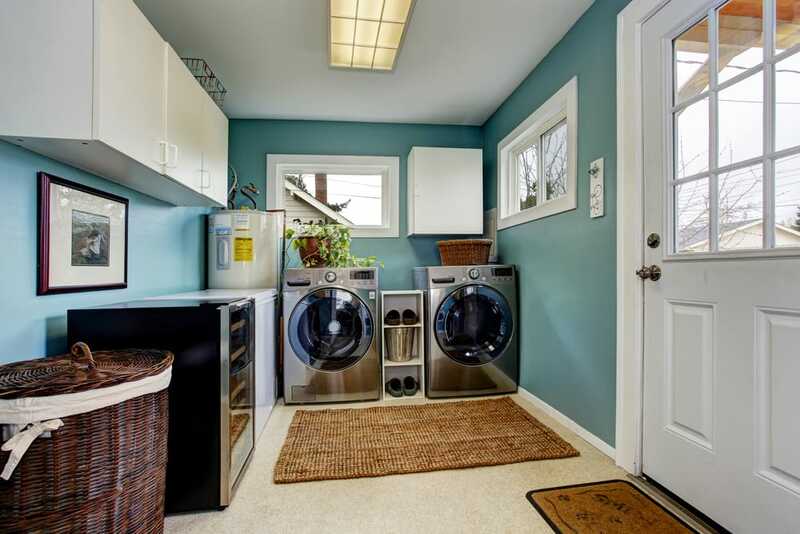 The laundry room can cover more purposes, and this is a good example given the incorporated dog-washing station. There’s also a little nook for your pet to relax after the bath. 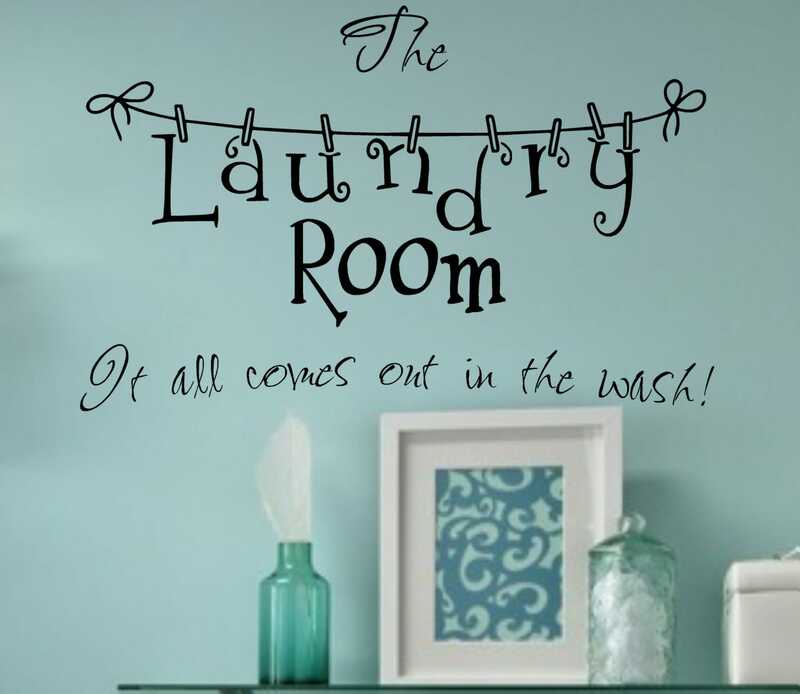 If you wish to make a more personalized message to decorate the laundry room, this can be done easily with the help of wall decals. It’s fun to try your hand at crafting vinyl decals yourself, but you will need a vinyl cutting machine for that. A more convenient method is to purchase some pre-made wall decals. Here’s an inexpensive model from Amazon. 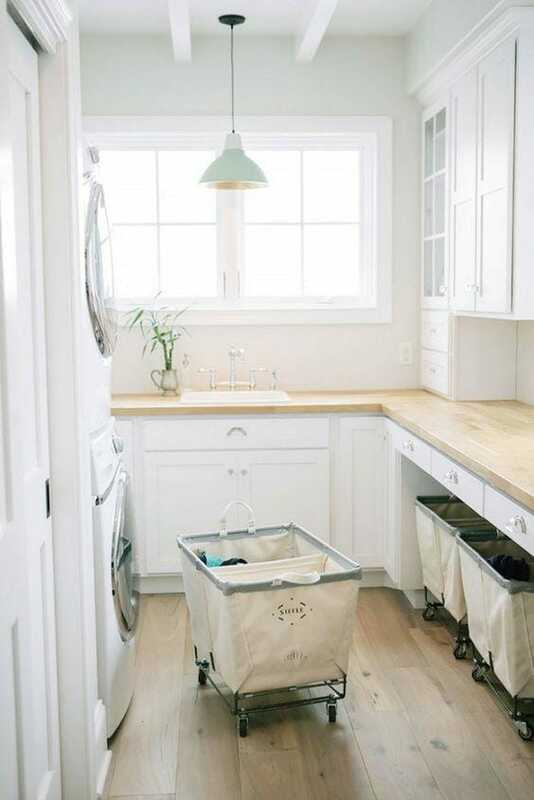 To organize a laundry room more effectively, it’s essential to incorporate as many space-saving solutions as possible. Here’s an interesting idea that involves the hiding of the ironing board in a drawer. This makes it so much more convenient when you need to set up the board and it saves a lot of space in the process. If you’re into a bit of DIY work, check out this hanging rack system that’s mounted on the door of the laundry room. As we’ve previously mentioned, storage in this area is essential. When you’re short on space, you need to learn to work with what you’ve got. This is a very simple project to try as you only need a suitable door rack to hold all of your cleaning supplies. We recommend this model from Amazon. Check out the full tutorial for this DIY project. While you can use a simple trash bin for this purpose, we think that a more compact option deserves your attention. 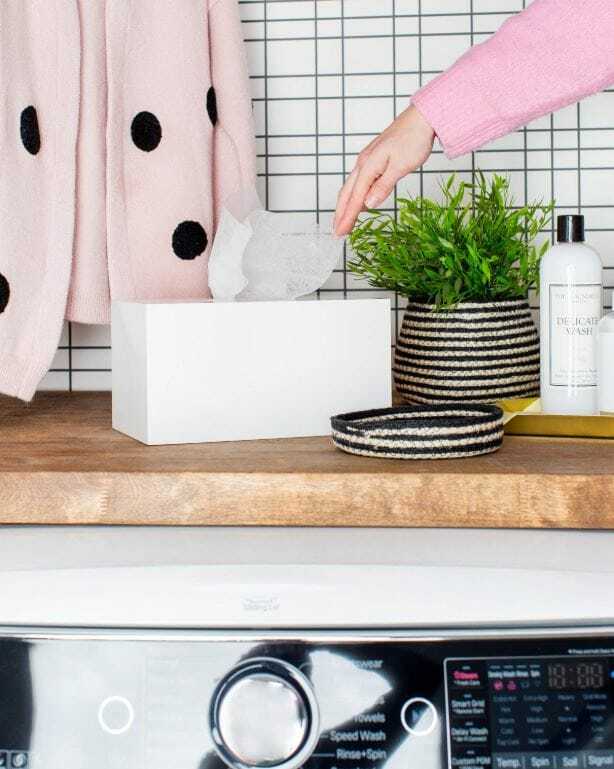 This lovely lint box can be crafted without too many difficulties offering you a stylish accessory and enabling you to save up all the lint that accumulates. This makes for a good material to start up an outdoor fire. The main item needed for this project is a brochure holder which can be obtained from Amazon. Take a look at the full tutorial. 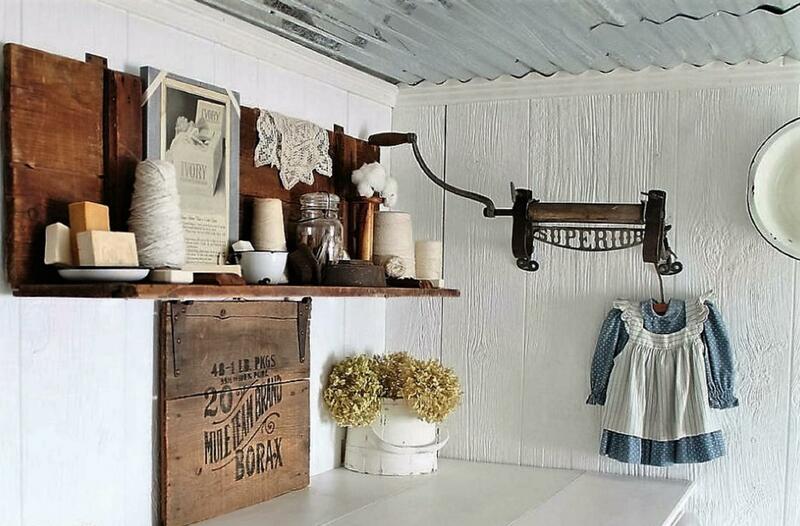 Fans of the rustic vintage style will probably adore this stylish look for a laundry room. While this room may not be your first option for a farmhouse makeover, it seems to work surprisingly well if you bring in the right decorations and vintage accessories. 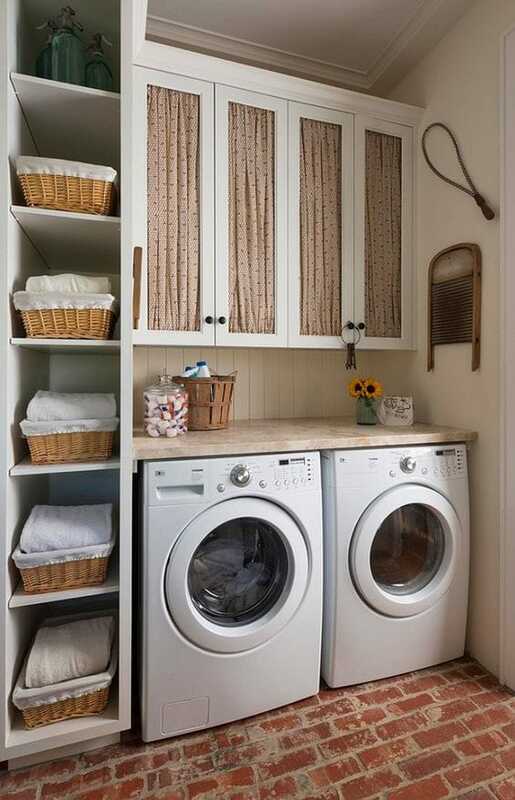 This is an ideal laundry room for anyone who prefers an old-fashioned look. 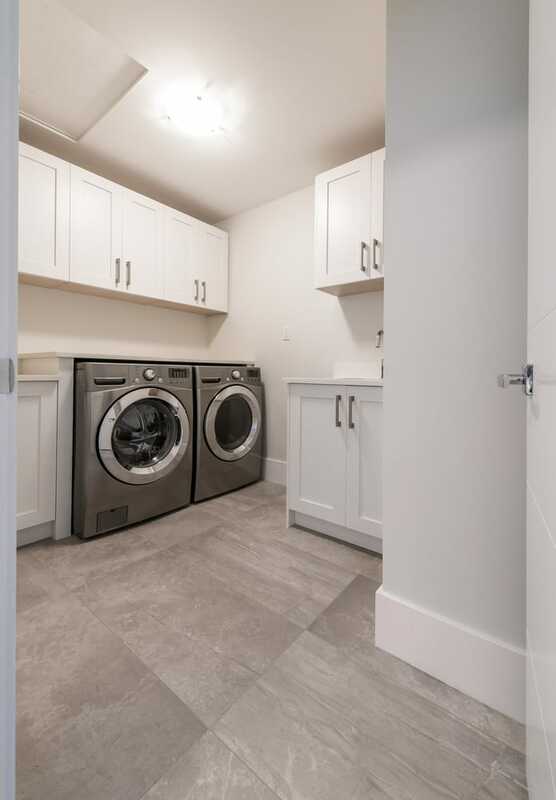 The full details of this laundry room design are available at this link. The floor of the laundry room can be often neglected. A beautiful rug can transform this area making it more comfortable for your feet and more welcoming overall. You can go for some colorful runner carpets if you have enough space. Other popular options are waterproof mats like this model from Amazon. They’re designed for the laundry room, so they’re much more durable. There are also hardly any compromises on style considering the rustic vibe of their patterns. 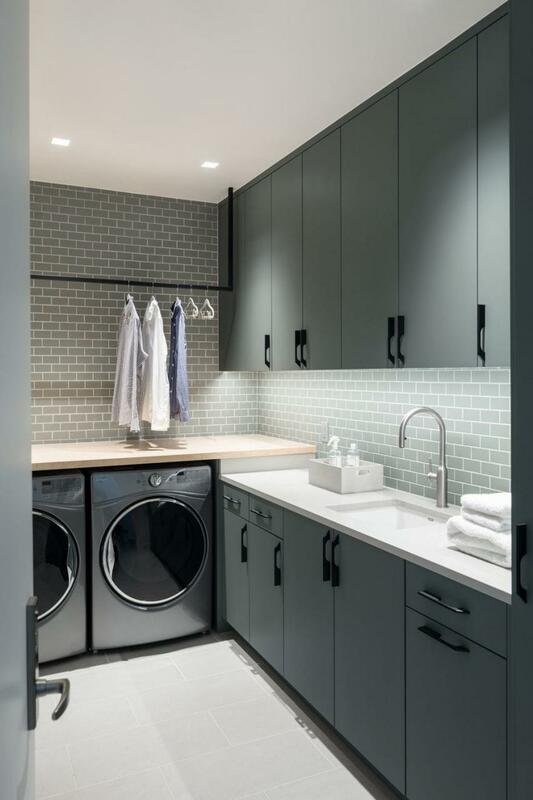 The complete opposite of the farmhouse style, this laundry room boasts an ultra-modern look with the help of its elegant neutral color scheme and clean, minimalist lines. The use of dark grey adds a sense of sophistication to an otherwise highly functional room. We also like the matching backsplash and generous counter space for doing the laundry in a stylish and productive manner. A relatively simple change can have a superb effect for any laundry room. Take the ironing board for example. 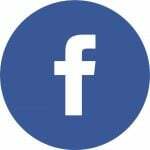 Are you bored of its bland look and wish you could improve it somehow? There are some DIY projects to help you in this regard. Instead of plain colors and florals, consider this patterned look which can be obtained by following this easy tutorial. 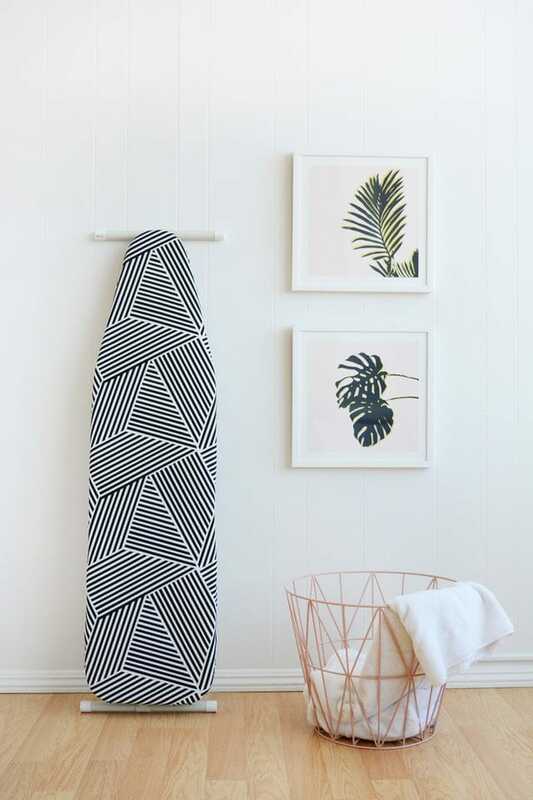 Now that’s the kind of ironing board that you can show off in the laundry room. Alternatively, you can buy a stylish cover on Amazon to get a fresh look for your ironing board. Clear jars work great in terms of storage. 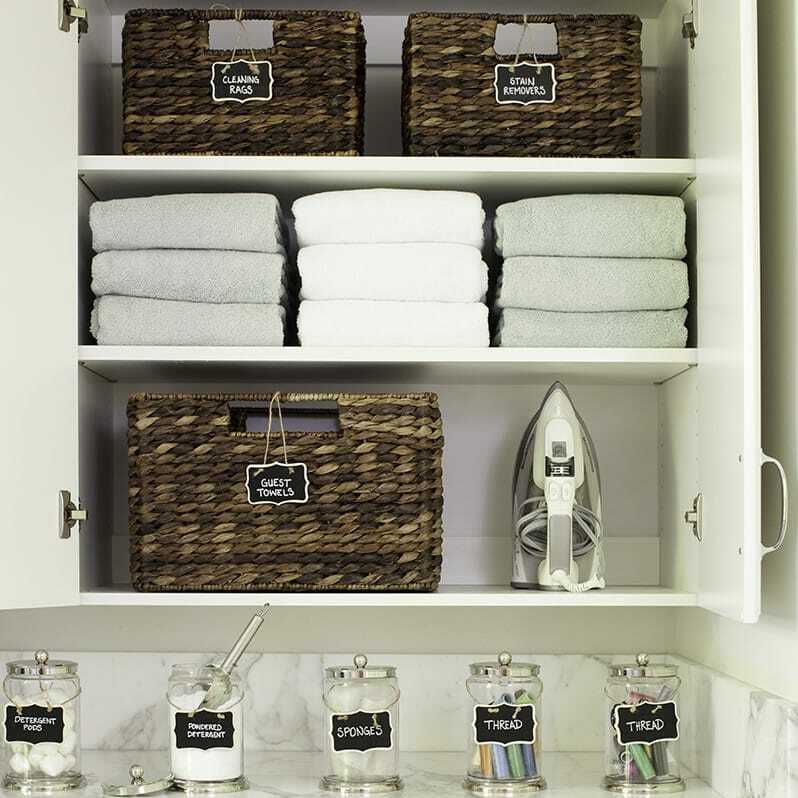 The laundry room is one area that can take advantage of glass jars to hold all kinds of accessories and cleaning essentials like detergent. This is a more stylish alternative to plastic containers. 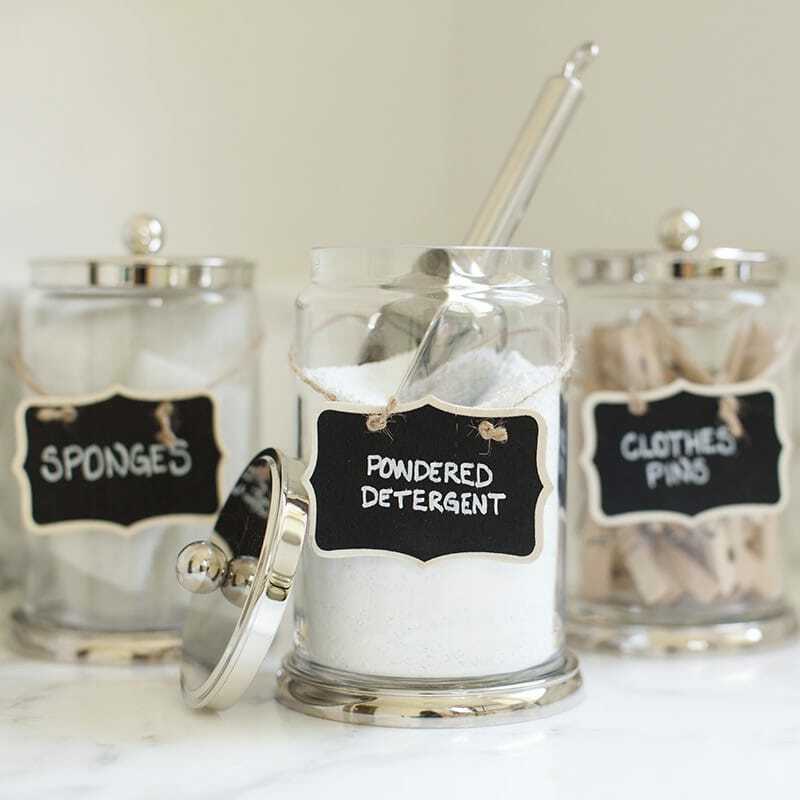 To boost the functionality of your storage jars, consider adding some handy labels to stay organized. Given the fact that cabinets can get quite expensive, you might try to find some alternative storage options if you’re on a budget. Open shelving and hanging rods are great solutions, but they can easily become disorganized and affect the look of the laundry room. The easiest fix for that is to create a curtained area like in this example. Keep all your supplies hidden when they’re not in use. 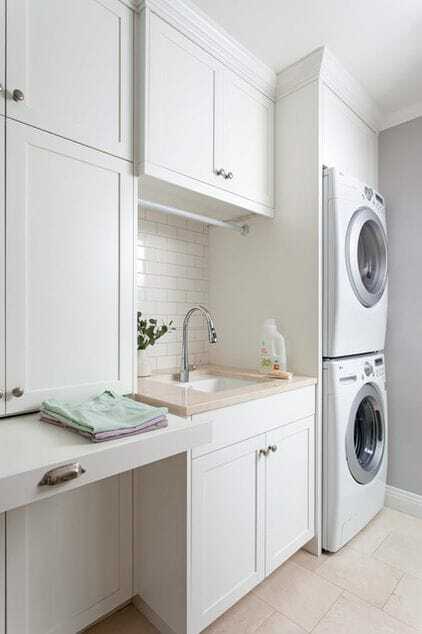 A more delicate approach when designing a laundry room is to use pastel colors, patterns, moldings, and elements that create a glamorous atmosphere. The chandelier here is a good example. We also think the cream cabinetry looks amazing when combined with pink details. 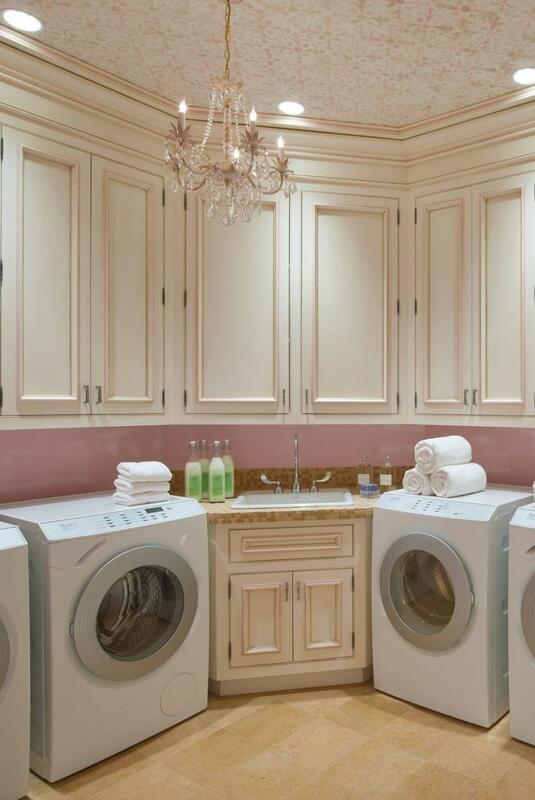 This laundry room offers a lovely mix of feminine style and elegance for a delicate and sophisticated ambiance. 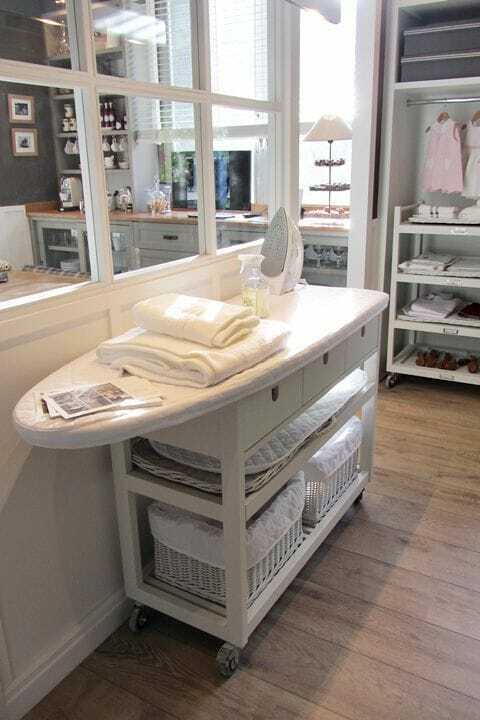 If you don’t have enough space to create separate areas for the laundry and mudroom why not combine them in one place? This is a clever idea for utilizing the available square footage in your home more efficiently. 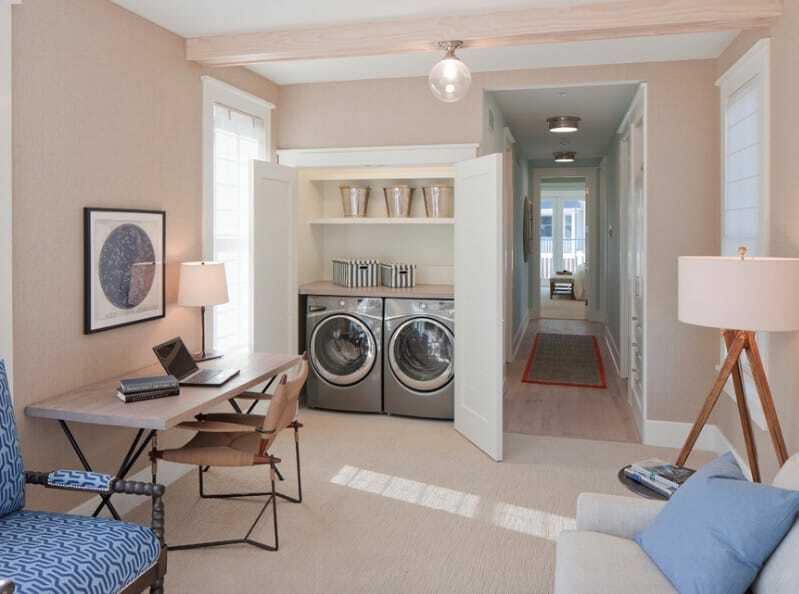 The laundry and mudroom combo can look great if you choose a light mint color scheme. The addition of more windows enhances the airiness of the area. 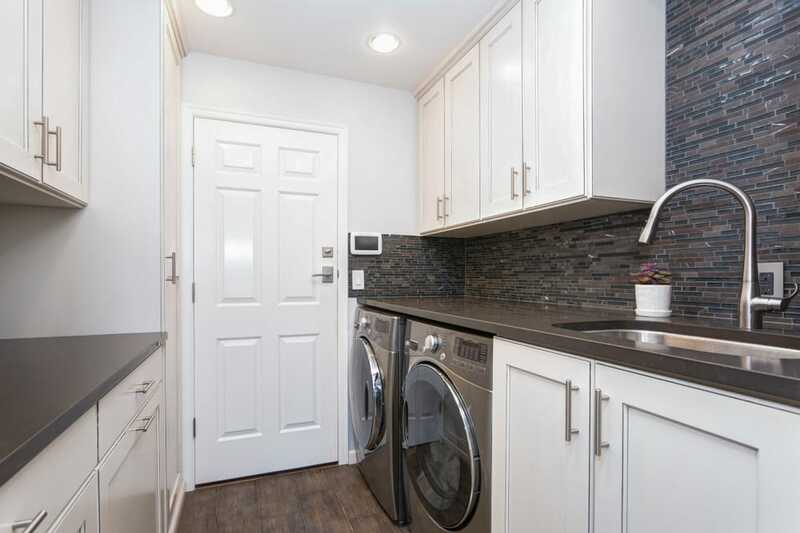 Sometimes the best color scheme for the laundry room is a good old white one. There’s an important reason for that as white is capable of enhancing the sense of space in the room. This means it’s an ideal color choice for smaller areas. This white laundry room doesn’t offer a lot of space, and yet it doesn’t feel cramped thanks to the smart organization features. It’s equipped with all the essential elements including the folding station, sink, and plenty of storage cabinets. When you’re dealing with limited space, it’s important to integrate some more multi-purpose items. Take this laundry room island for example. 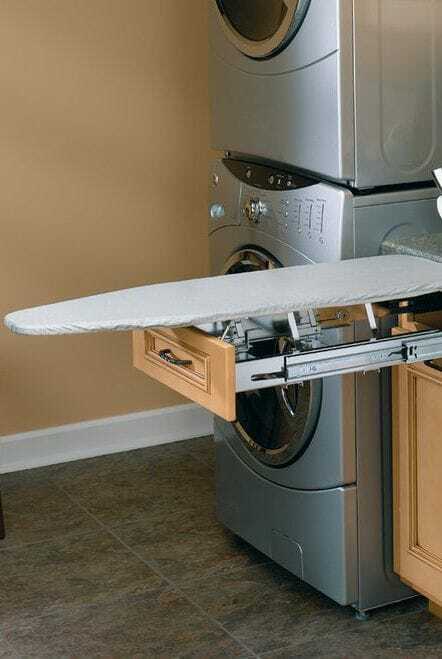 This a superb addition if you wish to increase the efficiency of your laundry room. It’s packed with lots of essentials, including an ironing board and storage baskets. For some extra flexibility, you can also move it around as the unit comes equipped with wheels. 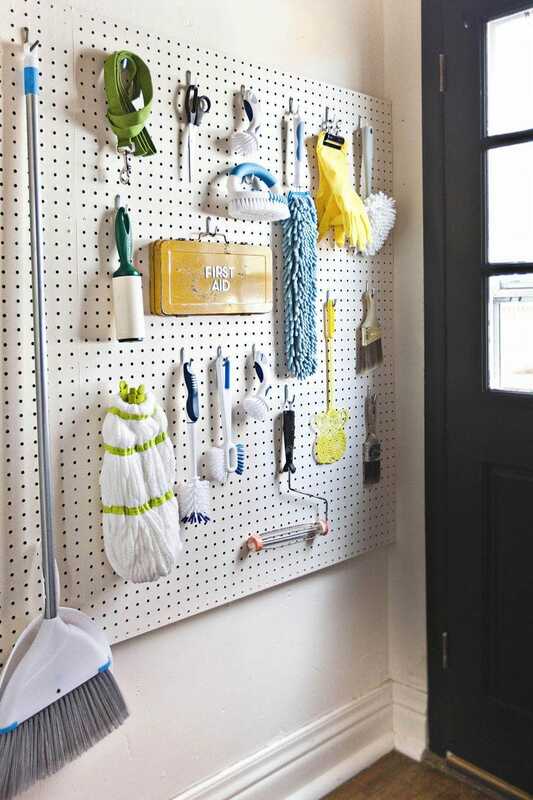 Instead of leaving the opposite wall of the laundry room blank, you can install a pegboard where various tools and cleaning supplies can be stored more conveniently. Grabbing what you need has never been easier. This is a recommended option for those who primarily wish to transform the laundry room into a functional space. 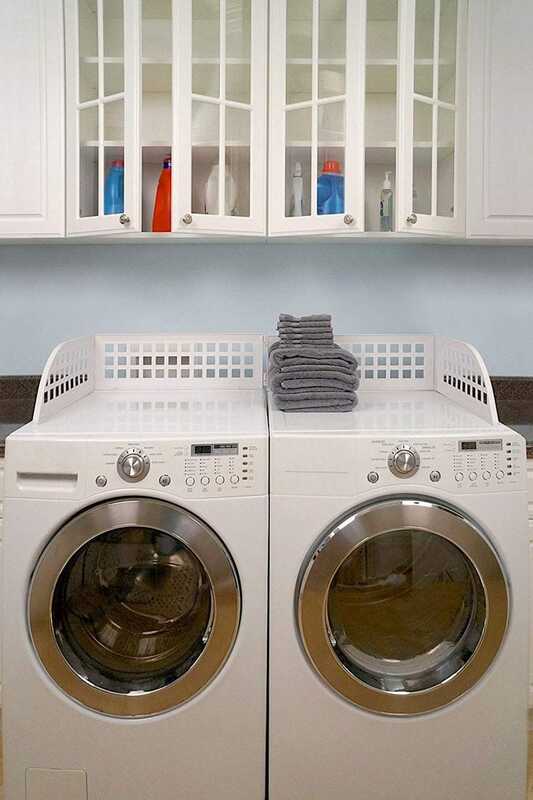 Adding a sense of uniformity to the laundry room helps to keep this area clean and efficient. When you’re looking at storage options, we recommend trying to match items for a uniform look. These wire baskets are pretty much what we had in mind. They allow you to store various supplies on open shelves and maintain a pleasant visual balance. Check out these wired baskets and Hyacinth boxes on Amazon. 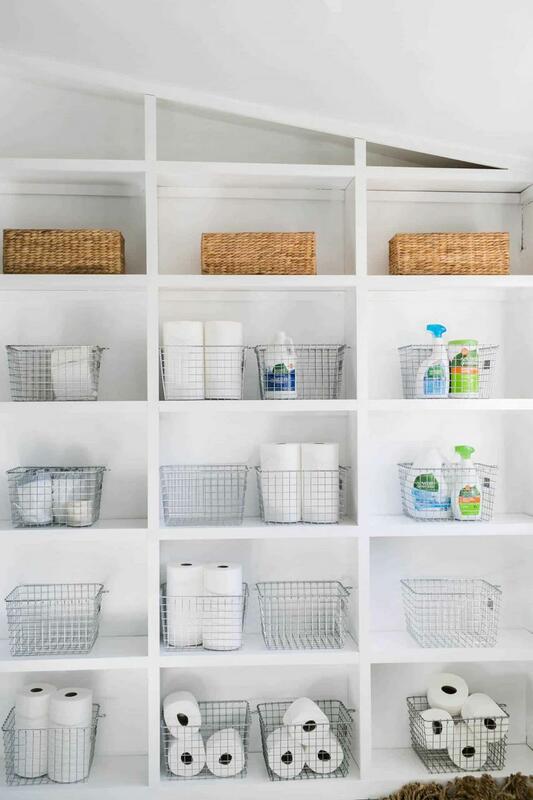 Staying organized in the laundry room can be difficult, particularly when you have lots of items and supplies. With the help of labels, you can create a neat look and never misplace anything. Baskets and bins can hold specific items and you can play with labels to find the best combination for your needs. Consider using chalkboard labels like these ones found on Amazon. They’re inexpensive and convenient as they can be quickly rewritten. The laundry room is probably not your first option when it comes to making a bold statement, but these painted doors can inspire you to try a more daring look for this area. 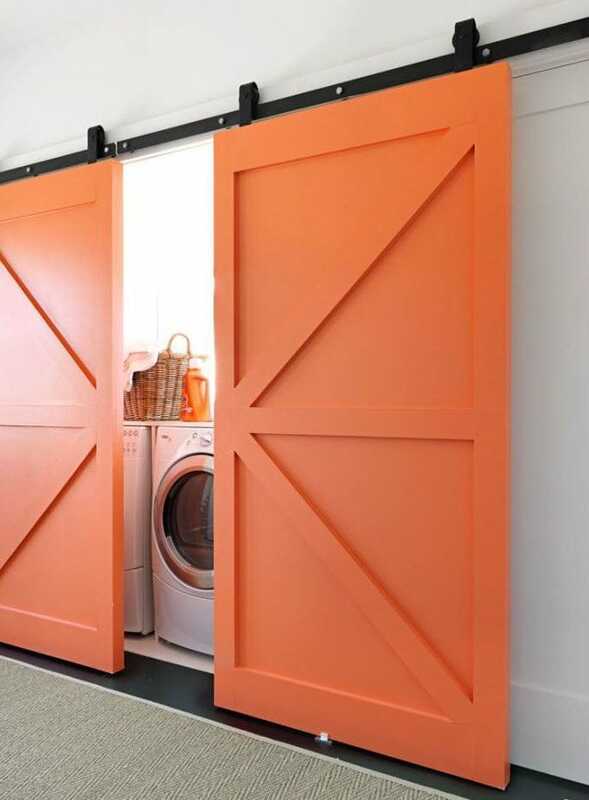 For those who are bored by conventional doors and want a bit of rustic charm, consider installing some barn doors for the laundry room. You can paint them in a vibrant shade if you wish to keep a more modern theme. 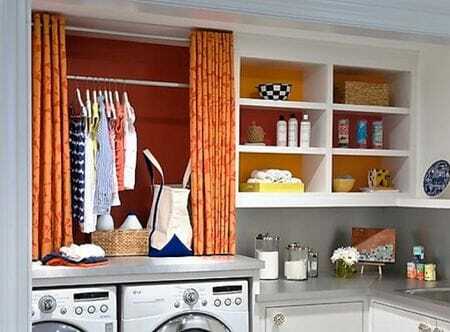 The bright orange used here transforms the laundry area making it a special place in the home. 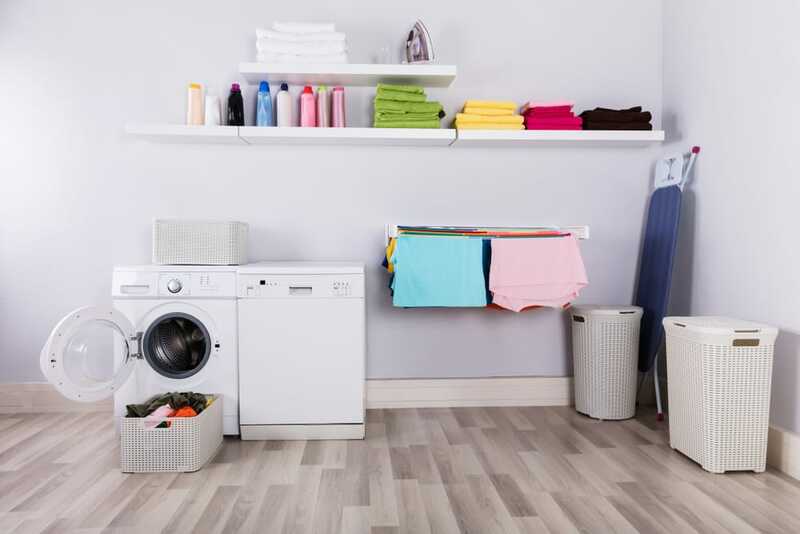 Even if the dedicated space for your laundry room doesn’t offer too much flexibility, you can still create a pleasant area to deal with this chore. 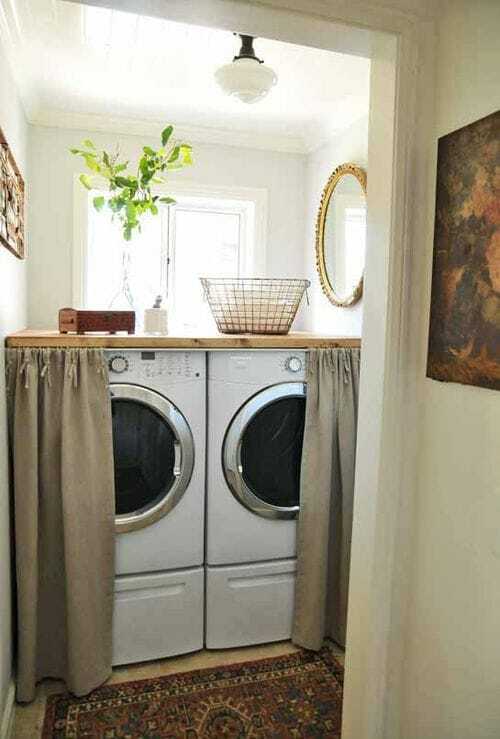 This small laundry room project is more of a closet, but it has all the qualities for a beautiful and functional place. As shelving can make this small room too cluttered, you can opt for some decorations instead and use pedestals under the washing and drying machines for storage. The curtain neatly hides the bulk of the appliances for a clean look. 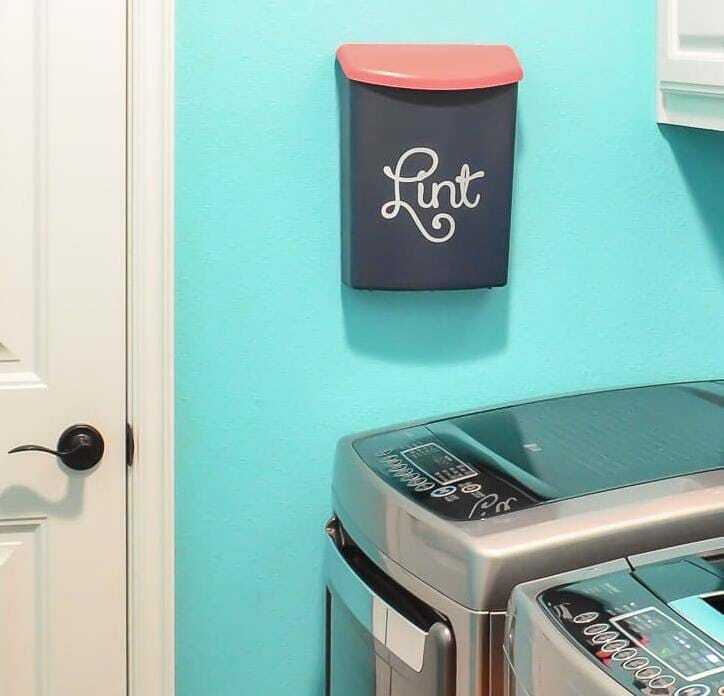 If you’re in the mood for some crafty projects that barely take any effort, this dryer sheet dispenser is a great addition for the laundry room. You will only need an old tissue box cover to ensure a steady supply of dryer sheets. Plain white appliances can get boring after a while. If you wish to give your washer and dryer a stylish makeover, it’s probably best to go for electrical tape. Painting a bulky machine like this seems too impractical and being able to remove the graphics as needed means that this is a renter-friendly solution. There are some interesting options out there, including vinyl, but it looks like electrical tape works even better as it doesn’t leave any residue. 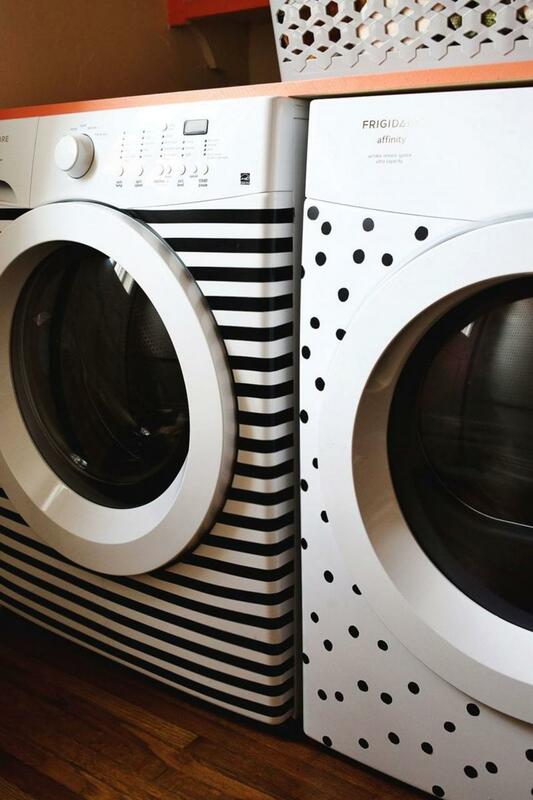 With some playful stripes and dots patterns, you can make the laundry room a fun place. Maximizing storage in a small laundry room poses a challenge. Vertical shelves can help you in that regard as they enable you to make better use of those awkwardly small nooks and areas. You can place your items in a smarter manner as the only space limit is the ceiling. By installing a laundry guard, you can prevent accidental falling of clothes behind the washing machine. Smaller pieces can be especially difficult to recover given how they’ll require moving the large appliance. If you want to avoid leaving forgotten items behind, check out this laundry guard from Amazon. Some people can’t afford to dedicate an entire room for the laundry. Being short on space can inspire you to come up with more creative solutions. One solid idea is to create a multi-purpose room that includes all the laundry essentials and also enables you to engage in other activities. A good example is an arts and crafts room or maybe you could try a small home office or a storage room. It’s all about using the available square footage in a more efficient manner.